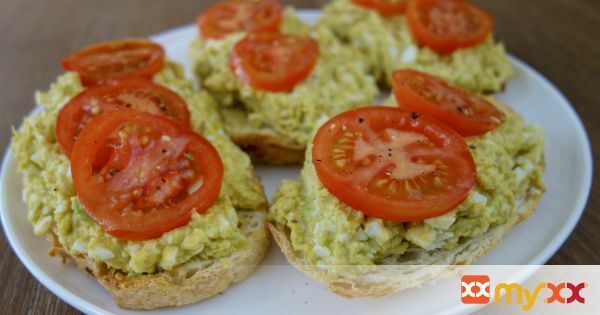 This 3-ingredient egg salad is delicious, fast, healthy and great way to start your day! Full of protein and healthy fats, this is ideal as a meal or snack. Don't let the hot sauce scare you, I use it more as a flavored vinegar (rather than spice), much like the flavor you'd get from mayonnaise. 1. In a pot over high heat, cover eggs with cold water, bring to a boil and immediately remove from heat. Cover and let eggs stand in hot water for 10 minutes. Drain, run under cold water and peel shells. 2. In a medium size bowl, mash together eggs and avocado. 3. Stir in 1 tbsp of hot sauce (it acts as a flavored vinegar that you'd taste in mayonnaise) or 2 teaspoons for less heat. 4. Season with salt and pepper. Serve on toast and top with tomato, in a wrap or simply on it's own. Enjoy!